Even though Gold surged on Friday after printing new lows, the price and momentum are still bearish as 61.8% of the gains are eliminated by this morning. The greenback's bulls took a breath on Friday letting this surge develop but the 95 handle for the Dollar Index has not yet been violated as the US yields are still on the rise. We will see how US yields play out during this week, but this is where investors wish to place their capital. The equity market is becoming more vulnerable with higher rates and Gold is yet to regain its allure as a safe haven instrument. 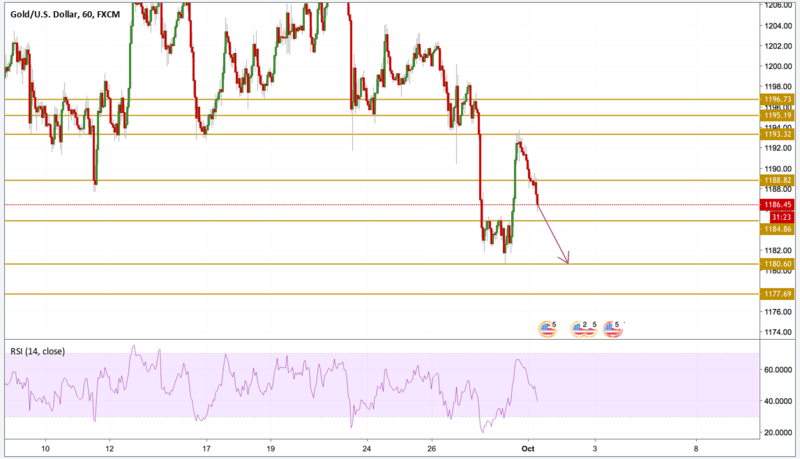 Gold is on its way to fully eliminate its gains earned on Friday after failing to hold above the $1190 level that became the key level for the future direction of the price. Momentum is currently bearish as we can see on the RSI chart with a lot more room to go and before it enters into a oversold state. A retest of the lows at $1180.60 level is more likely to happen but be careful from the potential double bottom with a strong divergence between the price and the momentum that could trigger the next reversal in the pries.